The family of Audrey Willetta McMurray (nee Little) sadly announce the passing of their beloved mother, grandmother, and great-grandmother at St. Marys Memorial Hospital on Friday, February 2, 2018 in her 90th year. Beloved wife of the late John McMurray (2017) and loving mother to Nancy (Martin) Walker of Virginia; Carolyn (Steve) Gorman of Burlington; Sharon (Rob) Staffen of St. Marys; Jayne (Pete) Greenough of Toronto; and Kevin (Irene) McMurray of Kintore. She will be greatly missed by her 12 grandchildren; Megan (Brian), Joshua, Callie, Katie (Clark), Allison (Mike), Julia (Brennan), Matt (Ashton), Candra (Brandon), Emily (Justin), Hayley (friend Chris), Mark, Brandon, and two great-grandchildren; Sam and Isla. Survived by her sister Florence Murray of London and sister-in-law Aileen Fairhall of St.Marys. Predeceased by her parents Jessie and Arthur Little, brothers Boyd (Jean) and Cecil (Janet) Little. She will be missed by her many nieces, nephews, friends, and neighbours. A special thank you to Dr. Thornton for her care and kindness and to the nursing staff of St. Marys Memorial Hospital. Audrey Willetta Little (a.k.a. Little Audrey) was born on a farm near Dorchester, Ontario on June 8, 1928. Her parents, Jessie and Arthur Little, raised their four children Florence, Boyd, Cecil, and Audrey in very humble surroundings. They were never in want and were blessed with simple luxuries. In the late 40’s and early 50’s, Mom worked for the Bank of Montreal in downtown London, Ontario. She boarded with her Aunt Lorraine and Uncle Norman. Mom enjoyed many outings with her friends and co-workers. They especially enjoyed dancing and spending time at the beach in the summers. In 1952, Audrey married John McMurray at Embro Presbyterian church and moved to the McMurray family farm located between Kintore and Medina. There they raised their five children Nancy, Carolyn, Sharon, Jayne, and Kevin. Mom was a member of Brown’s United church where she was on the UCW, taught Sunday school, sang in the choir, and prepared 12-15 pies for the yearly Brown’s chicken barbecue. Wearing many hats as a Mom, she was rarely seen sitting. Some of these many hats included homework helper, gardener, chief cook and bottle washer, laundress (using a wringer washer), chauffeur (to all of her children’s events), volunteer (at the church), farm assistant (to John), carpenter, cow registration artist, and crafter. At harvest time, Mom was extra busy in the kitchen preparing meals for the hired custom farm contractors (the Hutton’s, the Taylor’s, and the West’s). They truly enjoyed Mom’s home cooked meals and especially the large selection of desserts which included pies, cakes, cookies, and squares. You would often hear them say, “This is the best restaurant south of Medina.” When we were in our teens, Mom and Dad attended dances with their friends and family in Lakeside, Kirkton, and Wonderland Gardens. Mom also enjoyed dancing along with us at home on Saturday afternoons when American Bandstand aired on T.V. Her passion for dancing still lives on through her children and grandchildren to this day. 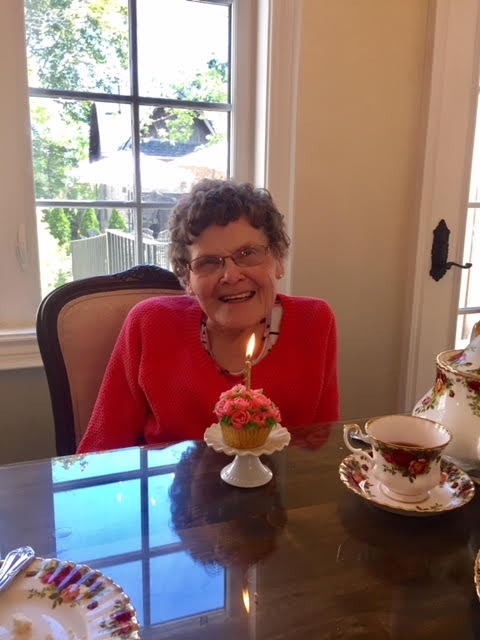 In 1983, Mom became a Grandma for the first time and fully enjoyed her new role; baking, mini golf, board games, movies, walks in the forest, shopping, and crafts were just a few of the many activities the Grandchildren loved to do with her. In 2009, Mom and Dad sold the family farm and purchased a home at Parkview East Rotary condominiums in St. Marys. They enjoyed attending the many neighbourhood get-togethers and Mom often commented on how wonderful and supportive their neighbours were. Mom was known to be a positive and kind-hearted lady with always a smile for everyone she met. She truly was the sweetest, most caring Mother and Grandmother we could ask for. We feel so blessed and honoured to call her Mom and Grandma. Cremation has taken place. Honouring her wishes, a Private family gathering will be held for her immediate family. In her memory, donations may be made to Brain and Mind Matters Foundation through the Stratford Perth Community Foundation (SPCF), Canadian Heart and Stroke Association, or a charity of choice.